On a quest for weight loss and redemption in the eyes of his wife, 560-lb. Eric Hites is biking 3200 miles from one coast to the other. 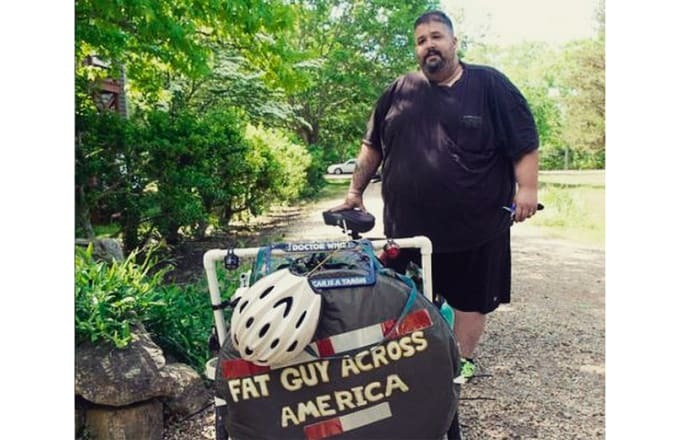 Hites, who is chronicling his journey on Instagram and his blog Fat Guy Across America, said he was inspired by the Proclaimers, of "I&apos;m Gonna Be (500 Miles)" fame. I blame the Proclaimers I really do. I will be riding a bicycle from east coast to west coast for a few reasons, 1. to prove things to my wife and my love. 2. to take back my health and to lose the pounds I have collected over the years. After separating from his wife last year ("for many reasons, money, issues at home etc," Hites wrote in a blog post today), Hites said he found "my drive, my trip, my chance to change my future." Once he settled on his plan and started out in Martha&apos;s Vineyard, his wife reached out. She said, "you are really on the Vineyard? " I said "yeah, I told you I had to change my life to change my future and build to prove that I really adore you." She said that was the most romantic thing anyone has ever done. Hites and his wife are back together, and he is well on his way to California, which he hopes to reach by the end of the year. Hites sleeps every night in a tent that he keeps in a trailer attached to his bike, he told NBC News—and he&apos;s already lost 50 pounds. "I get to lose weight and have fun doing it," said Hites, who is also interviewing people he meets along the way. "It&apos;s all about the journey." When he&apos;s done, Hites plans to write a book about his experience. Rick Ross Details His Weight Loss and #RossFit On "Good Morning America"